My wife and I suffer from seasonal allergies. Mine are so bad that I suffer just about every season. One of the best ways to combat allergies is to limit the amount of carpet in your home. The only carpet in our home is in the media room. Carpet is a good sound barrier. Our home is probably noisier than others. You can compensate with rugs, but that kind of defeats the purpose. Most of our home has hardwood floors. This includes the bedrooms, hallways, foyer, game room, family room, living and dining rooms. If a closet is attached to a room with hardwood floors, the closet likewise has hardwood floors. We chose to put down 3/4 inch by 3 inch quartersawn oak planks. 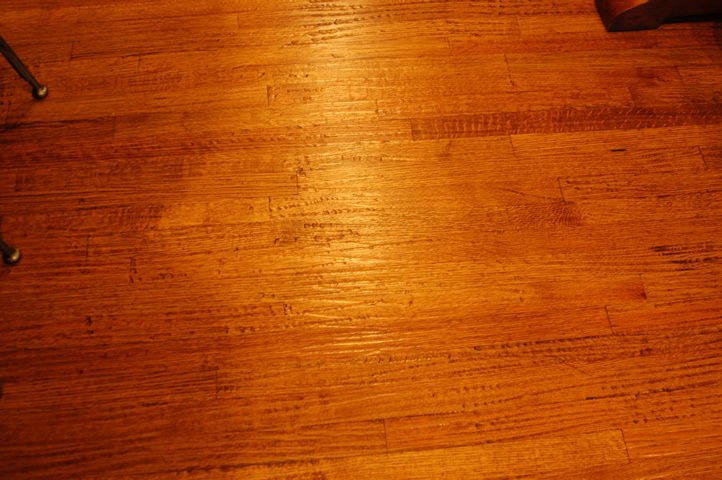 Our floors are hand-scraped for a less-formal look. Our kitchen, laundry room, all bathrooms, and one bedroom have slate or quartzite for flooring. Again, closets have stone flooring if attached to a room with stone flooring. 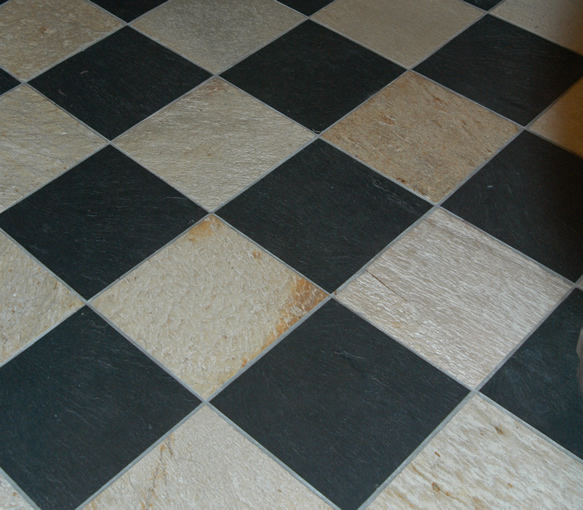 We like slate and quartzite because they are natural looking and non-slip. Our laundry room, mud room, powder bath, kitchen, pantry, and wet bar all use a diagonal checker pattern of Black Slate 201 from American Tile Supply and White Quartzite from IMC. We used the Black Slate 201 for the countertop in the laundry room. In our master bathroom and master closet, we used California Gold slate from IMC with a broken joint for the floors. The same slate with a regular joint was used for our shower walls and vanity countertops. Our "Jack and Jill" pass-through bathrooms and closets use White Quartzite from IMC for the flooring and countertops. For my wife's art room, art room closet, art room bath floors and countertops, and the upstairs kitchenette, we used CH405 China Multi Slate from American Tile Supply. Finally, for my daughter's bathroom and closet, we used Yellow Quartzite from IMC. For sealing your slate, quartzite, marble, brick, granite or any other type of stone, I recommend using the water-based sealers from Aqua Mix. Their water-based Stone Sealer's Choice has a expected wear of 15 years and is recommended for food preparation or serving areas. We chose this penetrating sealer from Aqua Mix because it has a no-sheen nautrual look and has low VOC's (Volatile Organic Compounds). Low VOC's means that the product will be easier on people with allergies or sensitivity to chemicals. Water-based sealers are typically low or no odor. For a great article on stone sealers, go to www.stoneworld.com and read the article by Bill Tran entitled, "Stone sealers: function, facts, fallacies." The technnical service at Aqua Mix is excellent. If you have questions about which of their products to use, call them. The one carpet we chose was for the media room. We were going for an old theater look in the media room. We chose a carpet called Masland Carpet Collection, Tangier, Pattern 9366, Color 618.